Hunting for condos near the Dutch School and Dutch Club. Avenue Park, Casa Esperanza, Duchess Crest, Evian Condo, Holland Hill Park, Maplewoods, & The Compass at Chancery. Case study: Baby-sitting the Dutch toddler to close in one day's viewing. This report provides some tips for Asia USA Rental Realtors on how to be more successful in closing a case using the Case of "Baby-sitting can be fun"
1. 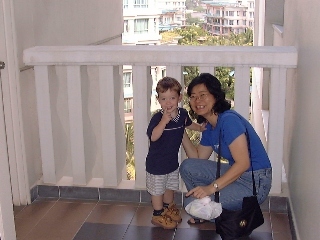 Prospect: Dutch couple with a 19-month toddler, relocating to Singapore. The husband contacted Realtor David by email and arranged for a viewing of apartments on September 22, 1999. He wanted to live near the Dutch School and Dutch Club. Rental budget varied from $6,000 to $10,000. 4-bedrooom condo preferred. 2. Problem: The Orchard Hotel receptionists and check-in staff said that the expatriate was not registered as a guest in the hotel despite 8 telephone calls in 2 days after his arrival. It would be difficult to schedule appointments. His office address was known but not his company name. This case would be lost since he did not connect to his email for the past 3 days. What to do? 2.1 Solution: You could go to the office address to find out. The Dutch School staff was contacted and we made sure that he received our message on September 21 when he visited the Dutch School. His mobile telephone number was not asked, as I assume he would be contacted by email or at his hotel. 3. Pre-Qualification of rental properties: You would be tempted to maximise your income by recommending the $10,000-type condos. You would forget that you might not be the only and exclusive realtor. Most expatriates have a busy meeting schedule and in this case, you were given only one day.You had the first bite of the apple only. However, there are expats who do use your services exclusively but do you want to take the risk of wasting time on house-hunting what the expatriate does not want? The customer is king. 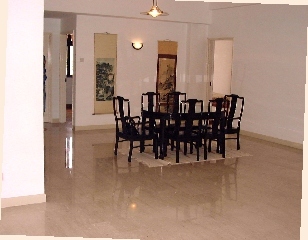 You will be competing with the best rental realtors in Singapore. 4.1 Written schedule. Many realtors think that giving a name card to the expatriate will be all that is needed. It may be tough for the expatriate to remember you as he may be meeting other realtors. Unless you have a charismatic presence, are outrageously dressed or are an excellent communicator, most likely the expatriate will not remember you as all "Asians look alike" to Caucasians? It is best you print a schedule of house-hunting using the Company's letterhead and put it in a file. It could be hand-written. The reason being that the expatriate is unfamiliar with Singapore housing and will need to spend time writing down names of housing. 4.2 Selling yourself. If there is some relevant local information useful, the expatriate will appreciate it. In this case, he was provided a colour copy of "The features of a luxury condo. You can provide your own information notes or book. September 22, 1999 9.45 am - 5.00 pm. Dutch couple with a 20-month old. Must be near Dutch School and Dutch Club. 3 or 4-bedroom. 4-bedroom preferred. Very hot day. Bring water bottles. Readers: Click on photos if you want to view bigger images. 1. The Compass at Chancery Townhouses 3+1 2400 sq. ft $7500. All 4+1 2500 sq. ft. Completed: 1998 20 units. Very impressed. For the 3+1, on the 3rd floor, there is no family area and only 2 instead of 3 bedrooms for the 3+1 units compared to the 4+1 units. These 2 bedrooms have attached bathrooms instead of 2 bedrooms sharing one. The 3rd level is an attic room with its own bathroom. Not full condo facilities. Many steps. Washer and dryer inside kitchen. Basement store room with bathroom can be used as store room. Possibly maid's room? Very quiet environment. 5-minute drive to Orchard Road. 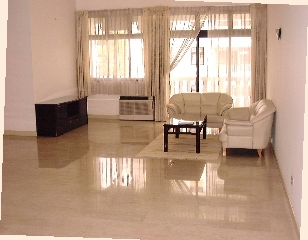 Add $500 - $1,000/month if you want a fully furnished unit. 2. The Wilby Residence 3+1 1800sf approx $6,500 pool view, ground floor. Flooring of living/dining area is homogeneous tiles, not marble. 2 years old. Caucasian enclave. Full condo facilities. Maid's services and free shuttle service downtown. 181 units. 4-storey buildings. One or 3-bedroom units only. 1-bedroom rents at $3,500/month fully furnished. Maid services are $500/month extra. Email judy@asiahomes.com or call +65 9668 6468 to see units. 3. Avenue Park 4+1 2700sf $5,000. 4+1 2200sf $4,500. Maisonettes. Guest room and kitchen at level one. Living room at level 2 and bedrooms at level 3. Too many steps which may cause 2-year old boy to fall down. Bathrooms are dated compared to new condos, a comment from the husband. Rambling ground good for small children. Pool and squash court only. 12 noon. 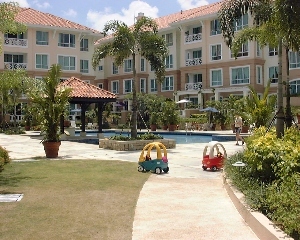 Evian Condo 4+1 maisonettes 3358sf $5,000. Walk up 3rd floor. Pool & security guard. No elevator. 23 units. 14 years old. Studio 64, 94 sq m. 2-bedroom 97-130 sq m. 3-bedroom 129-187sq m. Maisonette 184-338 sq m. Too big and old. 12.15 pm. Yang's Garden Village 3+1 2000sf renovated 12th floor around $6,000. 4+1 4000sf maisonette on 15th floor around $9,000. Good for expats who want lots of built-up areas. 12.45 pm - 1.20 pm. LUNCH BREAK at The Coffee Bean & Tea Leaf Cafe in Holland Village. The parking warden was active and had been scolded by a motorist who just issued a summons for not displaying a car parking coupon. Once the machine printed the summons, she could not do anything. The fine would be around $30.00. Newcomer expatriates must always carry some parking coupons if they rent a car. 7. Holland Hill Park 3+1 2070sf $5,000. Patio and garden. Gym, playground, security guard and pool. Excited about the unit as the ground floor is suitable for a 2-year old. But there is NO wading pool. The security guard permits only half of the auto-gate to be opened making it difficult to manoeuvre the car entering or leaving the apartments. 40 units. 7 years old. Low rise, low density. 3-bedroom 129-191sm. Unit for sale too. 2.00 pm. The Arcadia Blk Argos 7th floor. 4+1 3800sf $8,500. Too big. Caucasian enclave. 2.30 pm. Holland Peak Blk 25 B1-03. 4+1 1800sf $4500. Owner forgot to turn up. 2.45 pm. Holland Peak Blk 23 01-04. 4+1 2000sf $5,000. Master bedroom facing condo exit road. Wife was not interested as she did not road traffic noises. 11. Casa Esperanza 3+1 2000sf $5500. Incredibly large living and dining area. Great for expats with big furniture items. 90 units. Studio 107, 128 sm. 3+1 171-213 sm. No gym. 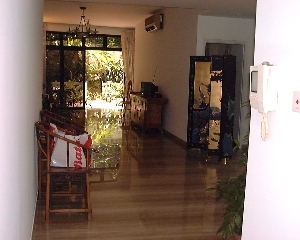 Swimming pool, wading pool, tennis court, 24-hour security, covered car park, playground, multi-purpose hall, sauna. 7 years old but looks good. Next to the Maplewoods Condo which is a roaring success with Caucasians despite its high density with 697 units. Maplewoods is 2 years old. 1.45 pm (re-scheduled from 12 noon as the agent had a lunch break from12 noon - 1 pm). 1.45 pm (re-schedule from 12 noon)..
13. Duchess Crest 4+1 1722sf, 04-01. Corner unit. The Dominion. The living room also faces another apartment. Master bathroom has window and is brighter. No maid's room but a small area in the kitchen (see photo below left) near back door. Back rooms facing Duchess Ave road. Wife dislikes the road frontage. Resort ambience and overall impression excellent. 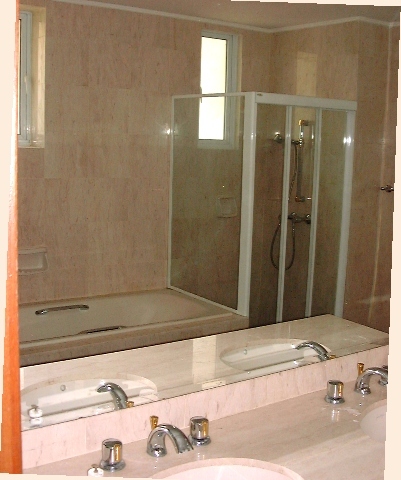 The shower cubicle (see photo right) in the bathroom of the master bedroom of the Duchess Crest Condo is an attraction, making older condos like the Casa Esperanza unattractive since the shower is located above the bath tub. It is difficult to shower in a long bath especially if you are tall. Note the "gold plated" taps of the dua basin sink and the white long bath. All these make you feel like renting Duchess Crest. 3.30 pm. Great Eastern Mansions 4+1+store. 1800-2000sf $7,500. Brand new. Liked unit but it faces the Holland Road and expressway. Caucasian enclave with many young Caucasian children seen. Very small gym. No tennis court. 15. Maplewoods 4+1 1800sf $5,500. 2nd floor, Bauhina, facing main road. Not viewed because the wife disliked road frontage. The Owner wanted assurance that the expatriates do not mind road-facing apartment before he would open the apartment. We could not assure him. Lush landscaping and almost full occupancy. Has mini-mart and golf driving range. Caucasian enclave with many Dutch and German expats. Not many good units available. 2 years old. 697 units. 2- bedroom 79-99sm. 3-bedroom 106-143 sm. 4-bedroom 165-176sm. 3+2-bedroom penthouse 237-283sm. Full condo facilities. Express bus to the downtown goes into the condo. Air conditioner units directly outside small kitchen need to be sealed off from the kitchen area. If not, hot air and noises get into the kitchen. Fairlodge 4+1 1861sf $6,000. Brand new. One unit available. Rented. Gallop Gables 4+1 2000sf, $9,500. 2 years old. Caucasian enclave. Anderson Green. Only one 4+1 (show flat) left. 3+1 1679sf. Brand new. Near Shangri-la Hotel and Orchard Road. Caucasian enclave. Villa Delle Rose maisonettes. 3+1. $7,000 - $8,000. Next to Botanic Gardens. Caucasian enclave. Too many steps for the toddler. Blossomvale 4+1. Brand new. Not available. La Suisse I 3+1 2600sf $5500. 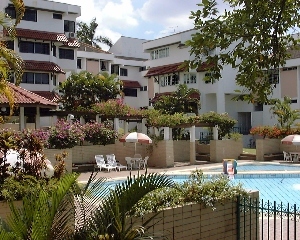 Condos within 10-min walk to the Dutch School but far away from main road. Not viewed. Regency Park 3+1 3000sf $8,000. Not viewed. Too far from the Dutch Club and Dutch School. Caucasian enclave. Orchard Bel-Air 4+1 3200sf $8,500. Not viewed. Too far from the Dutch Club and Dutch School. Email david@asiahomes.com or call +65 9668 6468 to see units. As time is precious for the busy expatriate spouse (majority are husbands), it is imperative that you qualify the properties well if you have a husband-wife viewing. You may not have a second chance if you waste the opportunity showing unwanted rental properties or those near the main road. In cases where there are toddlers and the house-hunting period stretches over one hot day, it is best to enlist the help of a baby-sitter. Toddlers always explore the surroundings, open cabinet doors, stumble on steps, climb up sofas, fall down chairs, distracting the expatriate wife from viewing the properties. With a baby-sitter, the Dutch wife could focus on house-viewing and had serious animated discussions with the husband. The toddler stumbled a few times. Unexpected events which would make a Singaporean mother's heart stop beating could happen. In this case, the agent at the Holland Peak apartment did not respond promptly to the door-bell. The toddler was pushing the main door. Suddenly, the agent opened the door and the toddler fell forward. He fell a few times on parquet floors. He tripped over the elevated tile platform meant for the fridge and hit his nose, at the Great Eastern Mansions. Daddy kissed his nose to soothe the pain. By 4 pm, he was tired and restless. The child tired out and fell asleep at 2 p.m. He was baby-sitted inside the car at the Holland Hill Park and Duchess Crest car parks. The Dutch couple could then view the apartments without worry. In fact, it would have been hard taking the sleeping toddler to inspect Duchess Crest's rambling grounds in the hot afternoon, for 30 minutes to inspect the gym, steam bath, playground and other facilities. The toddler and the babysitter were perspiring when we went to the basement carpark of Duchess Crest. Basement car parks are usually poorly ventilated. "Who's the boss?" asked Daddy. "Papa boss" he would smile. A talkative child who appeared not to need lunch unlike most toddlers. Drank lots of water and soft drinks. Your babysitter should be the one who enjoys the company of toddlers if she is single. It is best to get somebody to help you as it will be stressful for the expatriate wife to cope with toddler and apartment hunting. Safety concerns for toddler mean that the ground floor condos should be selected in your list. They are in great demand leading to higher rent being asked. If you have many ground floor apartments, you will be on the way home. 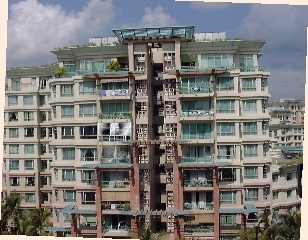 Eliminate condos which have low balconies, but Caucasian expats love balconies inside the apartment. Japanese expats love grilled windows but not the Caucasians. Enjoy the company of toddlers as they are fun. Have a partner with you to babysit the toddler while you concentrate on your work. The Wilby Residence 3+1 ground floor unit and 4+1 Duchess Crest apartment. It is not surprising as both have full condo facilities and provide shuttle services to the downtown to make up for the long walk to the main road in the case of Duchess Crest. Bus shuttle services are free for the tenants of The Wilby Residence but not for Duchess Crest. It had been a hot day's work seeing 14 properties in 7 hours for the expatriate who would have just recovered his jet lag after 4 days in Singapore. With pre-qualification of rental condos, there is a higher probability of a decision made by the prospective tenant in one day. He is unlikely to seek the services of another agent (you must be optimistic or not be in this line of work). There are more negotiations to be done. But you may be able to sleep easier on this hard day's night. Above units are for rent. Expats needing other units, call Asia USA Rental Realtors at +65 9668 6468, email david@asiahomes.com.